The Super Angel Plus Juicer upgrades and replaces the 5500 with a new motor, safety sensors and control board. 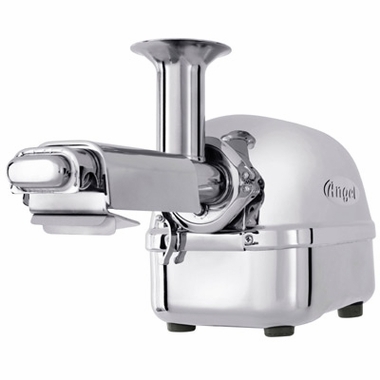 This latest Super Angel Plus juicer replaces the 5500 prepares healthy juice for you and your family. It is made of stainless steel and non-toxic plastic. With Super Angel Juicer Plus you can extract juices of almost all juicy fruits and vegetables like apples, carrots, oranges, wheat grass, barley grass, sprouts, herbs and many more. Along comes with Super Angel Plus is a measuring cup made with BPA-free Pyrex glass which is brand new! Low speed or rotation extracts maximum juice out the fruit unit. Anti-bacterial, non-toxic plastic and stainless steel body ensures hygiene and healthy juice. Please note this is not the commercial model. Commercial use (use in a business) of this product shall void the warranty. Super Angel 5500 Parts: You may purchase parts for your 5500 Super Angel HERE. If the part is not listed, please contact us as we sell all parts but only list the most commonly needed ones. I rolled the dice and bought this really expensive juicer on a recommendation from a friend and am so glad I took the risk. I was unsure if I should get the Pro or the Deluxe but settled on the Plus. It's been a great juicer. Quiet and with the best juice I have ever tasted. Trying all sorts of different things through it from veggies to fruit and have really come up with some great drinks. Thank harvest essentials for offering this great juicer at such a great price! The Angel juice has been a wonderful addition to our juicing program. The unit is so quiet and efficient while extracting every last drop of healthy goodness from leafy greens to wheat grass. The juicer is well-constructed, dependable, easy to clean, and worth every penny. We love our Angel! The Angel juicer has become the favorite thing to use in the kitchen for me, my husband, my 18 year old son who is making juice for himself all the time and my 6 year old daughter who is now drinking several glasses of fresh juice every day. It\'s been a great way to get her to have her greens like kale, broccoli, cabbage, parsley and more. We are all very happy with it. The quality is superior to any other juicer I\'ve owned. It\'s easy to use and easy clean. It\'s a high quality product. Wonderful product. I wish I had one years ago. Do not blink an eye on the price of this product, your health is worth far more. I am very pleased with this juicer. It is very quiet and does an excellent job. I find it easy to clean and love the fact it is all stainless steel. It is pricey but well worth the money. We are very happy w/ this excellent juicer. I don't think it takes that long to make and even cleaning doesn't take that long. The juice is great and the yield is at least 1.5 times better than the previous juicer we used. In the long run this will save us money. We can tell by the waste that it is clearly juicing almost all of the veggies and fruit we put into it. Thank you for a great product. I have been using this juicer for about 2 weeks now and LOVE IT! Easy cleanup, great non-frothy juice, and very little pulp. Would definitely buy again. Harvest shipped fast and securely!!!! Heavy duty Angel .... Will last for many years... Made from stainless steel .... Gears chew up greens superbly, which is a main for my juicing needs ... Speed, takes a while longer, but worth the wait ... Happy it comes with a pyrex measuring cup & squarish pulp container (which could be much larger) ... Easy to clean with the included brushes (2) .... Would purchase it again, no regrets. I love this juicer! I juice for my kids and I and I was tired of juicing daily plus not happy with all of the waste from my other juicer. I can now juice every other day and get almost double the juice from the same amount of produce! Not quite double but around 75% more with much less waste! I figure this juicer will pay for itself in less than a year with the savings on organic produce AND it has a 10 year warranty! Also the quality and the nutrients are better because it is a cold press machine. The saying of sometimes you have to spend more to save more. Here it is. Cheers (with juice) to beautiful health for all!